Do vaccines cause autism? Many parents think so – and the story is very familiar to many of us. Parents often report their child regressing into an “autistic-like state” shortly after being vaccinated. This term has become broadly known as Autism Spectrum Disorder. Health organizations such as the Centers for Disease Control and the Food and Drug Administration staunchly deny any possible link to vaccines. However, they may want to pay attention to a recent and important court ruling. According to a document filed on December 13, 2012, Chief Special Master Patricia E. Campbell-Smith awarded Ryan B. Mojabi $969,474.91 for injuries caused by the MMR vaccine. You should also know the money awarded comes from a vaccine tax and not from taking the vaccine manufacturers to court. Encephalopathy is a swelling of the brain due to infection. Is it possible that autism goes by a different name? If this is the first time you have seen or heard of the term encephalopathy, it may surprise you to see it used in thesame context as autism. The big question you may have now is, Can vaccines cause encephalitis, or swelling of the brain? A study entitled Unanswered Questions from the Vaccine Injury Compensation Program: A Review of Compensated Cases of Vaccine-Induced Brain Injury found the National Vaccine Injury Compensation Program (NVICP) acknowledged 83 cases of vaccine-induced brain damage that include autism. Many of these cases include encephalitis, or swelling of the brain. One resource many doctors and health professionals use for research on health conditions is called The Merck Manual, published by Merck Pharmaceuticals. “A virus directly infects the brain. Parents have been telling doctors for years that their child became autistic after being vaccinated. Even the most basic scientific literature points to the vaccines as the trigger, so why is the big problem of vaccination being ignored? If encephalitis and autism are related, you can see the huge problem vaccine manufacturers would have on their hands. Maybe the real reason the1986 National Childhood Vaccine Injury Act was passed was to protect pharmaceutical companies from the growing tide of vaccine-injured children. Under this law, no parent can sue a vaccine manufacturer. Parents consistently report having a typically healthy child prior to being vaccinated. 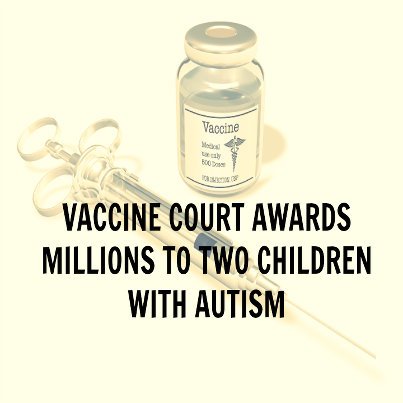 The National Vaccine Injury Compensation Program (NVICP) has already recognized vaccine-induced brain damage, including autism, as a vaccine injury. I’m glad Ryan Mojabi was awarded a large amount of money as his life and his family will never be the same. I suspect there are many other children suffering the same fate he did. The sad truth is that many more thousands of children who are injured by vaccines will never be compensated. If you decide to vaccinate your children, you do so at your own risk. No vaccine manufacturer is liable for your child’s vaccine-related injury or death from a recommended vaccine. NextBreaking-VIDEO: Famous Cardiologists turns down Megyn Kelly on Fox, but grants me an awesome interview!